Product of good quality at a reasonable price. Happy with purchase and service. Have used MobileFun before and always happy. How long it would last before it discoloured: the last one made it look as if I was a 40-a-day smoker after a couple of years. But it does the job. Just how much protection the raised corners protected the screen if the phone was dropped. This is a very nice case. It feels great in the hand and looks good. The only worry I have is that it is quite shallow and if I should drop my phone face down I am not sure that the sides are deep enough to protect the screen. I wasnâ€™t sure if the advertising would be as correct as it turned out to be. This case is thinner than my last one (another brand) and fits much more easily into pockets, etc. The thinness makes the phone buttons easier to use too. The ordering and delivery were very good and efficient. I wanted some protection for my new (first ever) iPhone, but didn't want to spoil the effect of this! After reading some of the reviews, I was a bit apprehensive. But I am very pleased with; it fits like a glove, and does not obscure the iphone logo etc. There was a comment on one review saying they couldn't get their phone to charge with this cover on, but I have had no problems (I was thinking of cutting the plastic tab off, but this wasn't necessary). I am pleased I went ahead and purchased this. It’s so good you can’t tell the phone is covered but it feels protected. Excellent fit for the I phone 5SE. Just as described in the details. As a bonus, has small flaps to cover the holes for charger and headphones. This protects from dust getting in. There are pros and cons to this item and it's pretty good value depending on what you are looking for in a case. Pros: Holes and buttons parts match up perfectly, plastic 'plugs' keep charge point and headphone socket clean. Cons: The case is completely flush with the screen, so there's no protection if you dropped it face down, but to be fair, it is sold as an 'Ultra-Thin' case and this is what it is. Nothing to get excited about. It will keep your phone clean but I doubt it would protect the screen if dropped. Easy to order, very well made and fits my mobile perfect. Fits perfectly. Phone doesn't look as if it has a cover on but is well protected. This is the second of these covers I have had and would buy again. Great value, perfect fit, nicely made. Protects without detracting from iPhone style. How much impact the case could absorb, ie reasonable drop height protection. Does the job - protects the phone whilst still seeing the colour of the case. Arrived quickly, fits iPhone SE well and looks stylish. Good value for money. “Olixar” is printed on back part of cover at the bottom so not entirely clear but not that visible. The gel 'holes' for the speaker when speaking were blurring all speech. Had to cut the gel casing away at the bottom of the phone for people to hear what I was saying. The bottom of the case needs to be completely cut away to expose the speaker area. I am pleased with this case. It feels nice, is not at all bulky and I would recommend it to anyone wanting a clear phone cover. The case goes over most of the buttons but they are not difficult to press. There are removeable hinged pieces that cover the earphone port and charging port. They are a tiny bit fiddly to remove but nothing too problematic especially for charging. If you are going to be plugging and unplugging earphones a lot it might be annoying but you could always just cut off the cover for that port. Looks good, improves grip. This plus a glass screen protector should protect the phone from most drops. Fits well although slightly stretched around the top button/camera. Headphone/lightning port covers are a good idea but can be a bit annoying. Case is light weight and fits phone well. The clear design shows off the phones design whilst still being protected. I would say that the edge needs to lip over the front screen a little more to protect the screen from breakage. Great fit on the phone, adds hardly any bulk and perfectly fitting dust covers for the charging port and ear phone jax. Very good. Thin enough to be unobtrusive but substantial enough yo protect agains breakages. Have looked at length for a decent cover to show off the rose gold colour of the phone - am really pleased with the product and wished I had found it sooner . Good quality. Bought this to protect my wife’s new SE, she said it’s perfect, so can’t disagree (I know my place). She wanted something that didn’t obscure the phone and gave some protection in the event of a knock, this fits the bill. This cover is perfect for my new Apple SE. It is a very good fit, easy to put in place and, most importantly, allows the lovely rose gold colour to show through. The holes for camera, charging etc are also well placed and no nasty rough edges. Lightweight, transparent, and snug fitting protection for my iphone SE. Cover over charging point is a bit of a nuisance. Better to just have a hole. Overall very pleased. Just what my wife wanted, non-slip grip and very thin. Perfect! The case highlights the colour of the iPhone. It is very thin so does not feel like a case! because of the material it is also non-slip and feels good to the touch. It is hard to get excited about a see-through phone cover but it is compact and a good texture. I have a love/hate feeling about the port covers though. Great to protect from dust etc but extremely difficult to open without hurting yourself. They could be improved. Very pleased with this gel case, it really does stop the chances of the phone slipping through my fingers, it's totally lightweight and doesn't notice at all. Very happy with quick delivery, thanks. Exactly what I wanted as it doesn’t detract from the phone. Nice and slim. showing good looking phone. Quite impressed with service. Delivery was great only took a few days. I love this case, not too big not bulky. The dust caps on the case keeps dirt away from usb/ headphone ports . Brilliant idea. Took a while to get here but I am really happy with the product. This is a must for all iphone SE users. It's a snug fit and looks great. It is hard to see on the phone, but will protect your phone if dropped. Would recommend. Don't even know it's there! This case is so thin and durable as I've already dropped it multiple times and gotten away with just a mark on the back. Overall I barely recognise it's there which makes it look and feel like there isn't any case. This gives a really nice sensation. This case fits my i phone SE perfectly and looks really good! The gel makes its easy to grip as well. I was told I was a "poser" for buying this product because it brilliantly displayed the lovely rose gold colour of the iPhone! GREAT LOOKING CASE.. CRYSTAL CLEAR. VERY SLIM. FITS PERFECTLY. IF I SHOW MY PHONE TO SOMEONE THE FIRST THING THEY SAY IS "YOU SHOULD GET A CASE FOR IT".. I HAVE IT'S INVISIBLE. :) I BOUGHT A CHEAPER ONE ONLINE (AS A BACKUP).. IT LOOKED EXACTLY THE SAME IN THE PHOTO. "SILLY ME". WASTE OF MONEY. THERE'S NO PLUGS, FIT IS LOOSE, IT JUST LOOKS CHEAP & IT FEELS CHEAP TO.. This case is really very good,doesn,t make your phone bulky, yet protects it really well, use with a tempered screen protector and the whole phone is covered without being much bigger than normal. Loved this very slim gel clear cover. Loved this slim gel clear cover for my phone. It has protection covers for my battery & speaker ports which I was delighted with as it protects your phone from any dust or dirt getting into speakers. I loved how slim the cover is and also the option for a clear one so I can see my rose gold iPhone too and have it protected. Very quick delivery and excellent prices on products and shipping. Will definitely be buying again soon! Excellent item and perfect fit for my iPhone SE. I bought the clear one and the clever little bobbles that you can feel but can't see stop those ugly water marks you get on the back of the phone with normal cases Great product, worth paying that bit extra. Great case - soft feel yet tough. Would recommend highly. Firstly, it provides very little, no protection to your phone. The case is very slim and tight fitting. If your looking for a case to protect your phone instead of it looking nice this is not the case for you! Exactly what I ordered, great value for money! Perfect fit. Good quality product. As described. This case meets expectations. It is a good quality clear gel case which is ultra thin, effectively covering your iPhone SE in a thin layer of plastic. This shows off the beautiful colour of the phone and does not add any bulk. 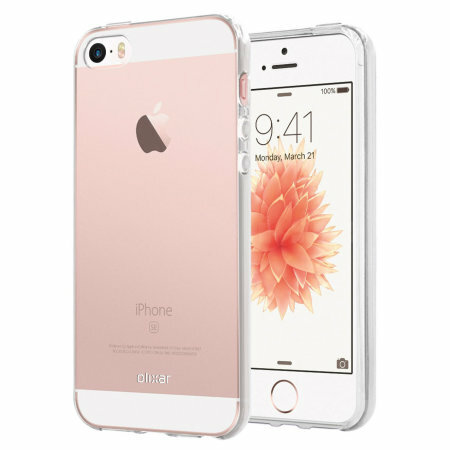 It offers little protection to case in terms of dents and drops, but will prevent scratches and scuffs. It has plugs to fill the charging hole and headphone socket, which may possibly be a good idea to prevent dust and dirt ingress, but are a bit of a pain when you are trying to charge the phone and/or listen to music whilst driving for example. Otherwise, an excellent product. The gel case arrived securely and was packaged well plus had updates on when the product was going to arrive. A fantastic product which protects my iPhone SE plus choosing the clear gel case meant the colour I chose I can see through the gel case. Extremely pleased with the service and products I received will definitely recommend to friends and colleagues. Many thanks Mobile Fun. This is a really good case. It was easy to fit, but the phone is very snug in it. It has a little 'stopper' at the bottom where the lightening cable plugs in and all the other 'buttons' are covered over but are still easy to use. Very pleased with this and would recommend. A very useful item which not only protects the case from scratches and bumps but also has a flap to protect the usb from dirt and moisture. Delivery was also earlier than promised!! This iPhone cover does exactly what is says on the tin. It's transparent, light, and is a durable cover for my iPhone SE which doesn't weigh it down or ruin the phone's sleek look. An excellent product which is exactly as described. It is VERY lightweight and shows the phone colour well and also enhances the already good 'feel' of the phone. There is a cover for the charging port and headphone socket ( which was a pleasant surprise as it was not in the description). It was delivered before the promised time and well packed. Exactly as described. Fast delivery. Cheap. Will definitely use again. Very pleased with my gel case. I am a happy chappy! Brilliant product as it's protective, really thin and adds no weight to my phone - exactly what I was after! Excellent clear phone cover, you wouldn't know you had one. Really good value. Happy with my purchase. Shows off my rose gold iPhone SE perfectly! Would have loved it to have come with screen protector as well though! Very well designed but all the button/socket covers annoyed the hell out of me. I cut off the one over the charging socket so that it would easily fit my charging base. Case was delivered quickly and matched image and description, for a great price. issue is with the plug ... getting the charger plug in can be a fiddle. This product does a fair job at protecting the phone without being bulky and obscuring the phone itself. However, I cannot charge the phone using some chargers without taking it outside of the case, which was disappointing. In addition, with removing the casing every night, it was not long before a crack appeared in one corner. Much thinner than I expected. But almost adds no bulk. Fantastic purchase for the price. Good value for money and delivery was on time.